Cavern of the Damned is now available for Pathfinder (through DriveThruRPG) and for Dungeons and Dragons 5th Edition (through the DM's Guild)! God, has it been *that* long since I posted anything here? 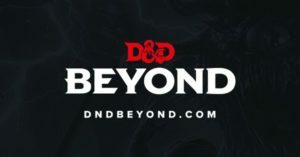 My year has been kind of chaotic, to say the least... but leave it to Wizards of the Coast to announce something that might just bring this blog back from the dead: at PAX, WotC announced D&D Beyond, a new suite of digital tools being created by Curse to support D&D 5th Edition. Wait, what? You mean you've heard this story before? Well... about that... Time for a history lesson. In the days of 3rd Edition and 3.5E, WotC created the Open Gaming License (OGL, for short) so that publishers can create D&D content. Soon the market was saturated with content, and everyone was reasonably happy. But the OGL created something that blindsided WotC: Paizo went through the OGL with a magnifying glass and, soon enough, Pathfinder was born. Suddenly there was a new player in town that directly threatened WotC's crown as the king of fantasy RPGs. WotC was terrified, and from that point forward they became more protective of their content than ever before. When 4th Edition (4E, for short) came around, WotC decided to close the door on the possibility of such a thing ever happening again, so they discarded the OGL in favor of the Game System License (GSL, for short). The GSL did allow some publishers to release material, but it was heavily restricted and had several limitations as to what you can actively publish. Yes, you could continue to publish things using the OGL, but besides certain things you could not include legally (creatures that were part of WotC's "intellectual property") you could make no mention of WotC or D&D at all. Many were forced to do silly things like say their product was "compatible with the 4th edition of the world's most popular roleplaying game" (a claim that itself was in doubt due to the rise of Pathfinder). Then there's the whole situation regarding the digital world... At the beginning of 4th Edition some of the core books were available in PDF format, but WotC quickly realized that they had no control over their distribution and weren't making as much money off them as they could. They were, in their eyes, losing money. So they yanked all the PDFs, took a step back in to the dark ages and pretended PDF technology didn't exist at all (some argue that this is the same reason why Dragon and Dungeon magazines were terminated; there was no way to make reliable money off them). Only recently, with the appearance of the DM's Guild, did PDFs return... and with such an absence of PDFs that was fostered over so many years, the demand for PDFs exploded and it was a rousing success. For 5th Edition, WotC decided to go back to the OGL, but there's still an air of uncertainty as far as digital tools. It's not that people can't create the tools... it's that people are afraid to. WotC legal is a nasty foe to have (trust me on that), and many that have tried to create online tools before were violently shut down. There's such a cloud of uncertainty around digital tools that no one dares to do them for fear of WotC's wrath. Prior to 4th Edition, in what you can arguably call the early days of the internet, WotC didn't have many digital tools to speak of to support 3rd Edition and 3.5E. Creation of such tools was in the hands of third parties, who could freely create these tools under the conditions of the OGL. When 4th Edition's GSL came around, the GSL had a specific clause added that never appeared before: third parties were explicitly denied creating any digital tools or applications using the 4th Edition ruleset. WotC seized on the opportunity to create the tools themselves, and DDI (D&D Insider) was born, where WotC would charge a monthly fee for users to access their digital tools. There's just one problem with that: WotC is not in the business of creating software (with the growth of Magic the Gathering Online, that has recently changed... but, even so, MtG's their golden goose). It never was, nor should it ever be. Yet they tried, and the results were disastrous. 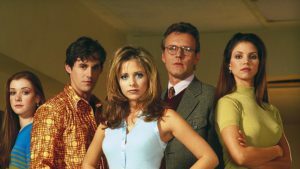 At first they created a standalone application to create your characters, but WotC quickly realized there was no way they can charge a monthly fee for something that can be used offline. So they abandoned the standalone application in favor for an application hosted on their website. And to give you an idea of how much of a mess that was, do an experiment: go find any experienced software developer you know and see how they recoil in horror when you say the word "Silverlight". Almost as soon as 5th Edition was announced (to be honest, I don't remember the exact timeline here), WotC announced that the 4th Edition tools would no longer be supported and would eventually be abandoned entirely. This went along with the new mindset WotC had: basically pretend that 4th Edition never happened. DISCLAIMER: The following is based on discussions I had with someone who, for now, asked to remain anonymous. Since WotC legal has me on speed dial, I cannot elaborate on where they got this information, but I personally trust it. Trapdoor Technologies was a modest company that had an interesting product: a way to get content online and hyperlink the ever loving crap out of it. Admittedly, not a lot of people were using their app in the first place, but it was a nice idea at least. But there's one thing that made them different: they were gamers. Basically the entire upper level staff at Trapdoor were heavily in to RPGs (they were the first group to ever playtest a product of mine, Cavern of the Damned for Pathfinder). And they saw that their tool would be a really cool idea to use for RPG content. So they took a shot and pitched their idea to someone (I don't know who) at WotC, and that person at WotC loved the idea. At first Trapdoor only suggested the product they had - hyperlinking D&D content - but WotC is the one who asked Trapdoor if they can do that *and* create a character generator to boot. Trapdoor, a company with not much of a development team to speak of, agreed to do just that without having any real idea what they were getting in to. Contracts were signed, Trapdoor got some funding to begin development on what would end up bring Morningstar/Dungeonscape, and spent six months developing the product before its announcement at Origins. Thing is, Trapdoor seemed as much of a developer "shop" as WotC was in the 4E days. They seemingly had no idea what they got themselves in to, and had nowhere near the infrastructure and resources to deliver a product of such scope. Prior to this they hadn't even created an Android app at all ever, so they immediately had to run around and find the developers to actually do that (I have to admit, I offered my services to them to do that). When someone brought up desktop support, they were equally flustered. During this time, Trapdoor was in constant conflict with WotC over pricing. Trapdoor wanted to price the tools themselves cheap, preferring the users to spend the money on the actual books. WotC, for who knows what reason, wanted to go the other way: they wanted to add micro transactions *everywhere*. For example, they wanted to charge $1.99 for each class and each race you wanted. But, so long as the funding continued and the fans seem so like what they were doing, Trapdoor pressed on because, after all, they did have WotC's blessing to continue... right? After GenCon of that year, in an act that should come as a surprise to no one that has dealt with WotC before, everything changed. Apparently, the person at WotC that was dealing with Trapdoor was working autonomously, and had not even bothered to run it up the chain of command. In other words, 600K and six months were spent developing Morningstar while the upper echelon of WotC management - and, specifically, WotC's branding and legal departments - had no idea it was happening. As soon as the "powers that be" found out, chaos ensued. WotC immediately demanded that they remove the books from Morningstar, which was the whole reason the project was green-lit in the first place. Without the book content, Trapdoor lost the only thing that WotC had apparently agreed upon, and they were left with not much of a product after that. Trapdoor panicked and tried to renegotiate a new pricing deal with WotC, but WotC didn't see the future in the same way. Not only did WotC immediately terminate the contract, but they effectively threw Trapdoor under the bus and chastised them for "not meeting WotC's expectations." Trapdoor was thrown like a discarded bone at the fans, and they mercilessly tore into them. Trapdoor tried to stay afloat, but there was no wind in their sails. In the eyes of the public, they failed. As a company, they didn't last long before their investors pulled the plug and shut them down. Trapdoor was effectively an indie startup that was barely staying in the black, but Curse is an established software development company with over ten times the staff (141 employees, at least according to their company profile). Curse is also owned by Twitch and has multi-platform products out there in the marked that are used by tens of thousands of gamers, so they've arguably done this before. But Curse is that and only that: they actually are a programmer "shop". I have no doubt they can create a good product that would be easy to use, but they are only creating a front end for WotC's content. WotC has absolute say in how much access to that content costs, and as we've described above: when it comes to the digital realm, WotC is still in the dark ages. Based on a Reddit post by the product lead at Curse, it looks like WotC is leaning towards the micro-transaction route that they tried to ram down Trapdoor's throat. So expect to pay as much for a 5th Edition character class as you would for a handful of hearts in Candy Crush. I have confidence in Curse being able to make a decent app, but this project might be doomed from the start because of WotC's pricing model. I remain cautiously optimistic that WotC will see the light some day and change their ways. We can only hope. In case you're not aware, our first Kickstarter for The Coming Dark, Chapter One: Into the Light has finally launched on Kickstarter. You would think that would be cut and dry. Well, that's not the case. Someone linked us to your Kickstarter and I wanted to touch base about a few things. DMsGuild creators cannot release titles on both DMsGuild and DriveThruRPG and they cannot use Kickstarter to "sell" their DMsGuild publications. The wording on your Kickstarter makes me think this is more of an OGL type product, which is great because we have a ton of awesome 5e OGL content on DriveThruRPG and you are already set up to sell there. You would only need to remove the DMsGuild elements (logos and text) from your Kickstarter page and continue on with your plans to sell on and fulfill your project via DriveThruRPG.com. At first I thought it was simply semantics... My original listing made references to Drive Thru RPG even though I mean the DM's Guild; the reasoning is that, let's face it, both websites are one in the same and differ only in branding. So, in response to that email, I removed all references to Drive Thru RPG and stuck to my plan of releasing for the DM's Guild. The issue is you are in violation of the license on DMsGuild with your Kickstarter. All DMsGuild creations must remain exclusive to that storefront. They cannot be sold on DriveThruRPG, other storefronts, nor via Kickstarter tiers. 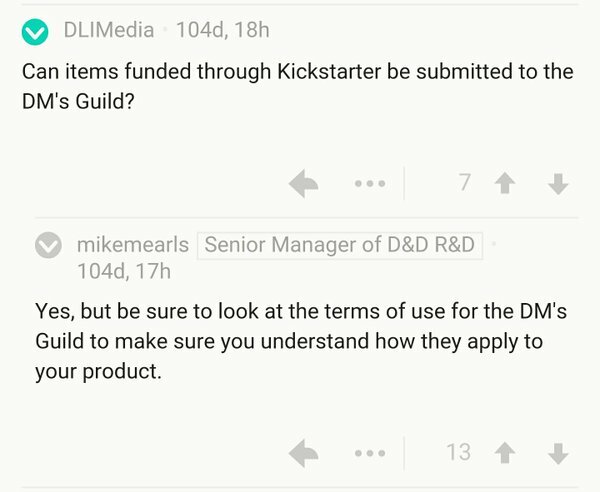 While it is true someone could run a Kickstarter to fund artwork or development of a DMsGuild title, they cannot offer tiers that provide backers copies of the title product. So, I imagine tiers would have to be "special thanks" or "game with the designer at Gen Con" or "your likeness used as one of the NPCs" all backers would still have to buy the book on DMsGuild once it launched as the publisher wouldn't be able to sell them a copy via crowdfunding. Now think about that for a second... I can use Kickstarter to fund art for a project, but I can't actually provide that product as a reward to my backers once it's done. 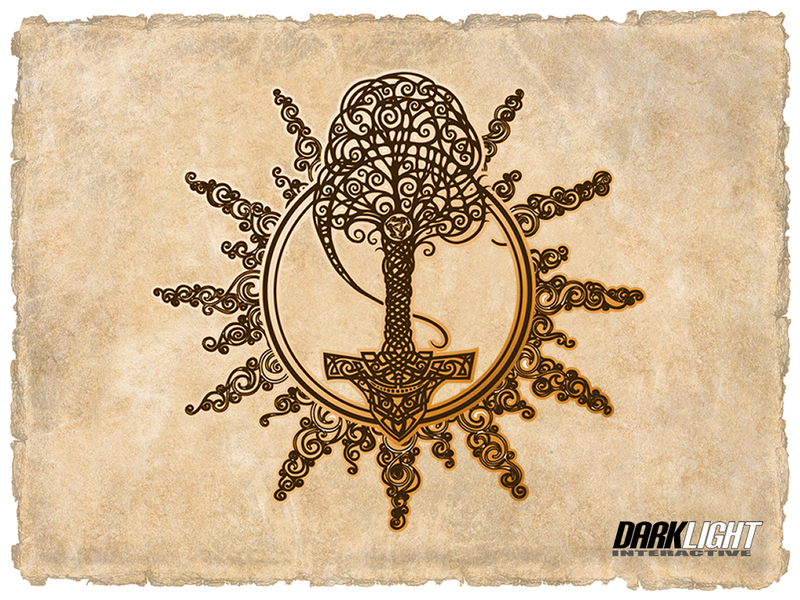 Backers are REQUIRED to purchase it through the DM's Guild, even though they already provided funds via backer rewards. Provide my product on DM's Guild FOR FREE or "pay what you want" (which could also be zero). Backers pay what they paid for it; anyone else gets it at whatever price or free. Not exactly the best solution from a business sense, but that's an option. Provide my product on DM's Guild at whatever price I choose, but give a discount coupon to all my backers for them to acquire it at no cost to them. Based on the above, not exactly sure I can do this either. Provide my product on DM's Guild, but require all backers to pay more than they've already paid to get it there. This feels unethical. Provide my product on DM's Guild, but buy copies myself and send them to my backers. This feels... well... stupid. But, in light of my past legal issues with D&D publishing, I really don't have much a choice here... Until I get further clarification from Wizards of the Coast (with which I'm trying to communicate, but they don't exactly have an easy way of doing that), I will likely switch my product to go OGL. I'm not happy about doing that, but this goofball licensing agreement doesn't give me a lot of choice. I will continue to try and get additional information, and will update this accordingly when I do. The DMsGuild license specifically agreed to by content creators states that all DMG titles are exclusive to the DMsGuild.com storefront. Putting the PDF on Kickstarter violates that exclusivity. You are specifically listing your title (understanding that it isn't officially released yet) on another site and not on DMsGuild. It wouldn't be available on DMsGuild until after you've collected funds and finished the project. DMsGuild creators do not currently have the tool set to upload PoD files themselves. It does sound like making adjustments and releasing this title on DriveThruRPG as a 5e OGL product would work better for your overall setup. First off, since the point of the Kickstarter is to fund editing and art, that it won't be available until after - well after, actually - the project ends is kind of a given. Secondly, that poses an interesting problem... if I go the DM's Guild route, I can't offer hardcover discounts to my backers because there's no way for them to actually get a hardcover through the DM's Guild anyway. It *must* be done through DTRPG's default site, so the OGL is the only way to get a hardcover for any 5E product. @BrainClouds they have the final say, as they're the ones who created the legal text and manage the program. Well that settles that I suppose. As several of you may know, I've had a little project of mine - the campaign The Coming Dark - in development for quite some time. 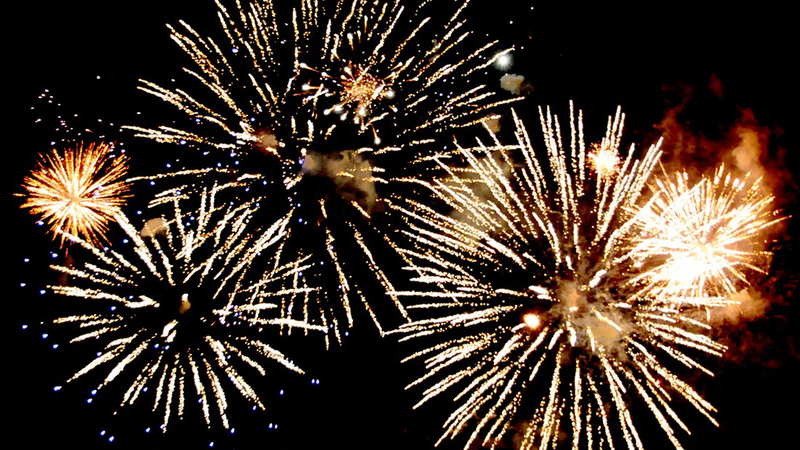 Almost five years, to be precise... it's technically the reason this blog exists. 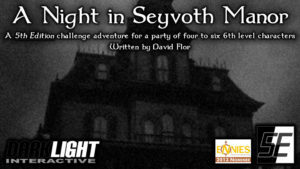 Over a year ago I decided that I was going to launch The Coming Dark, Chapter One: Into the Light as a Kickstarter. That's easy to say, but the fact that I'm writing this a year later without having launched anything yet says otherwise. I think that deserves explanation, or at least discussion; doing so may or may not my product or my image, but I feel some things need to be said. If you follow me on Twitter, you know that sometimes I'm probably more open about my personal problems than I probably should be. After all, here I am trying to come across as an industry professional and a publisher but at the same time I'm talking about my own personal problems and issues. I know it's probably inappropriate, and I've had many people tell me "you know, maybe you shouldn't say that publicly"... but I don't exactly have anywhere else to say it. I've mentioned this before as well: although I don't have a clinical diagnosis, I'm reasonably sure I regularly suffer from depression. Granted, I'm not a doctor, but I can sort of feel that I suffer from it more often than most. With that comes a sense of despair and a fairly large lack of motivation to do anything, even those things that you love. As a result of this feeling, I've lost count at how many times I've looked at this campaign and thought "what am I waiting for to publish this? I'll get on that tomorrow!" ... and never do. Be it depression, be it fear of rejection, be it aversion to briefly becoming a shameless salesman while the listing is active... it's always something that makes me think "I'm not ready." In the back of my mind, there is also that fear that I may fail. This project is very personal to me - it's actually dedicated to both of my recently deceased parents - and I can't help but think that a failed Kickstarter would be mentally disastrous. I have the fear that if that does happen - however unlikely it may be - I would have failed them and failed myself, and I likely wouldn't be able to ever recover from it. I'll be totally honest here: for a while, I've been horribly terrified at the possibility of overwhelming success. I have what I consider a very small goal ($2K), but I have this fear that if the Kickstarter does overwhelmingly well and I suddenly have tens of thousands of dollars handed to me on a silver platter... given the personal problems I deal with on a daily basis, would I actually use that money for what it's intended for? I am openly critical of projects that raise an ungodly amount of money and three months later say "we spent it all on shoes and don't have anything to give you." Having that happen to me terrifies me to the point of paralysis; fear of making the wrong decisions, or fear of making inappropriate decisions, makes me feel that I would rather not be in that situation at all. I don't want overwhelming success, so what would I do in light of such success? Spend it on actually fulfilling purchases or buy a container full of mammoth tusk d20s? You may not have noticed because the internet is what it is, but you'd be hard pressed to find a photo of me online; those photos of me that are out there weren't actually posted by me. That's actually on purpose, and I honestly prefer to hide behind my "digital rabbit" avatar than use my actual photo. I've hidden my appearance so well that at GenCon 2013 nobody would have known who the hell I was if it wasn't for the Twitter ID on my show badge. Why? You see, I've actually been "doxxed" before... As a result of an alternate reality game I was once involved with, I was throw to the wolves that are 4chan. I've had photos of me posted on public forums I frequent in an effort to mock and humiliate me. I've been crank-called as a result of this exposure. I've been threatened online, and I've had my family threatened (even though they knew nothing about them) as well. Suffice to say, it wasn't pretty or pleasant, and it's not something I'd like to go through ever again. 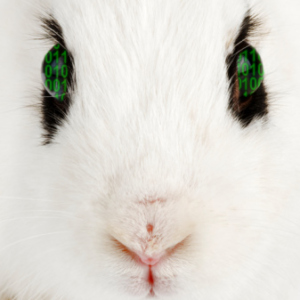 Since then I've retreated to being the "digital rabbit" avatar (which was part of the first alternate reality game I ran), and I've effectively built a brand around that image. I have thousands of followers on Facebook and Twitter, but outside of close friends and family I'm pretty much known only by that image (for the next GenCon, I probably should get it made into a T-shirt...). It's who I've become, and what I'm known best as. Because of past experiences, the idea of making a video for the sake of Kickstarter concerns me. I've weighed whether it's necessary, and depending on who you ask it may or may not be, but these days once your image is out there it stays out there... Five years ago it was possible to purge, but not now. I've been stung before, and those scars haven't quite healed yet. Whether a video is absolutely necessary or not is up to discussion, but I can't get myself over the stage fright and the thought that I would have to step out from behind ths curtain I've built just to shill my product. Is it necessary? Is it worth it? I've been thinking long and hard about this, and have come to the conclusion that TCD: Chapter One needs to be launched one way or another. And now, with the recent release of the 5E licensing, it's the best time to do that. So I'm going to take a very big risk: I'm going to launch it without a video... focusing all my efforts on the copy on the page. The way I see it, my goal isn't very high so it should be OK... and, worst case, if I see it's not going to make it I have two options: (1) create a video while the project is active, or (2) re-launch it with a video after the first one fails. If all goes well, I won't need the video at all and life goes on. I know the numbers... I know the likelihood of success is higher with a video... but I think I can still make it. I'm in the process of tweaking the listing, but barring any convincing arguments or discussions it's going to get launched and launched soon. So, if you've read this far, what do you think?